Vanguard Developed Markets Index Fund (VDVIX) is an index mutual fund. It uses its assets to purchase stocks of companies located in developed foreign markets. These companies are located in Europe, Asia, and Australia, which make up about 75% of the non-U.S. equity market. The fund advisor is Vanguard Equity Investment Group. It is managed by Christine D. Franquin. This foreign large blend mutual fund is tracking the FTSE Developed ex North America Index. The expense ratio fee is only 0.20%. This investor class has 1,369 holdings. You can buy this fund for your brokerage or retirement account with as little as $3,000. You may also find other classes of this mutual fund. The other classes are Admiral Class (VTMGX), Institutional Class (VTMNX), Institutional Plus Class (VDIPX), and ETF (VEA). The admiral classes fund has expense fee of 0.09%. Morningstar has ranked this international stock fund with 3 stars rating. 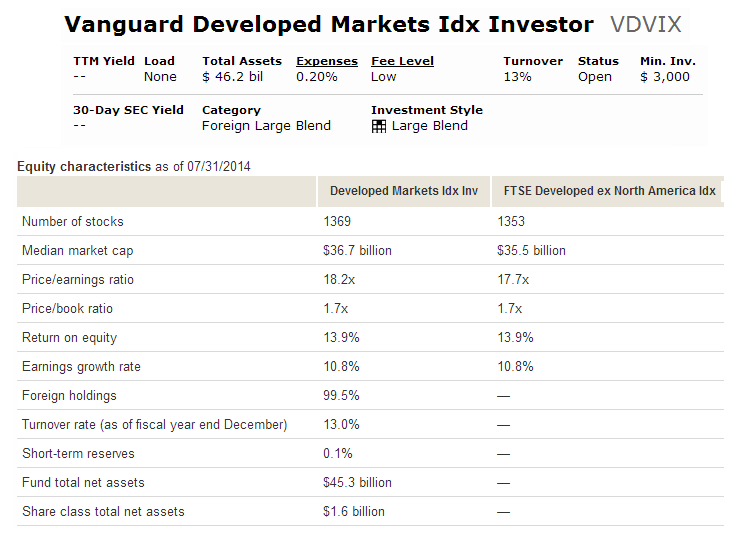 This top Vanguard fund has returned 8.18% since its inception. The top 3 region allocations are Eurpoe, Pacific, and Middle East. Top 6 stocks in its portfolio are Royal Dutch Shell plc, Nestle SA, Novartis AG, HSBC Holdings plc, Roche Holding AG, and BHP Billiton Ltd. Top 5 countries in its assets include Japan, United Kingdom, France, Switzerland, and Germany. Since its focus is on non-U.S. stocks, the fund can be more volatile than a domestic fund. In addition to stock market risk, the fund is also subject to currency risk and may have a higher degree of country risk than other international funds, since it tends to invest more heavily in stocks of certain countries. Long-term investors may wish to consider this fund complementary to a well-balanced domestic equity portfolio. This Vanguard Developed Markets Index Fund has a low expense fee. It is still a new fund and there is a lack of tracking error.